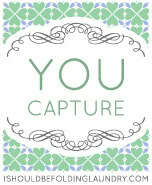 This week's "You Capture" theme is PINK. I took this picture a few days ago and think it's pink perfection. Head over to I Should Be Folding Laundry to see all the pretty in pink entries.